Marvin Johnson was a consummate blue-collar fighter. Exhibiting no airs about himself, no attempts at cuteness and lacking the fundamentals of cockiness, he walked to the ring with one aim in mind. To sling leather at his opponent until his foe dropped to his haunches. And with a patent disregard for today’s ‘win this time, look good next time’ approach, Marvin Johnson was one fighter who made it a point to leave nothing in the fuel tank for a safe journey home. DH: Marvin, you’re from Indianapolis, is that right? MJ: That’s right, born and raised and still here to this day. DH: Did you come from a boxing family? MJ: Yes, my oldest brother is Hank Johnson, who had a successful amateur career. He got me started. Well…he made me follow suit. I think he just needed someone to punch around (laughing). But when Hank was drafted in the Army I continued on since I was enjoying it by then. DH: Where did you get your start? MJ: At the Indianapolis PAL. I was only 14 at the time, but I told everyone I was 16. There was a Cop instructing there named Colion ‘Champ’ Cheney, who was a heavyweight contender during the Joe Louis era. ‘Champ’ taught me everything. He was my trainer throughout my amateur and professional career. DH: Did he frown on or try to convert you from your southpaw stance? MJ: No, ‘Champ’ said the southpaw style would be to my advantage and he left it alone. DH: You were a highly decorated amateur. What titles had you picked up? MJ: I was 1971 National AAU champion and 1971 and ’72 National Golden Gloves champion. DH: Your 1972 National Golden Gloves title qualified you for the ’72 Olympic Trials, is that correct? DH: Who did you beat in the finals of the Trials? MJ: I beat Mike Colbert of Portland at the Trials in Ft. Worth and again in the boxoffs in New York for the Olympic spot at middleweight. DH: What did it feel like for a kid from Indy representing the U.S. at the Munich Olympics? MJ: It was terrific, but I had been around by that time. I had already fought all over Europe in international competition and was ready for it. But I must mention that it was my brother Hank who really pumped me up for this. He too fought in the Trials and although he was also a middleweight he chose to drop down to light-middleweight so we wouldn’t have to fight one another. Unfortunately, Hank lost in the semi-finals. But Hank was well thought of and eventually was named Assistant Coach of the ’76 Olympics. DH: When the Israeli athletes were taken hostage, describe the atmosphere of the Olympic Village. MJ: The Olympic Village went into complete lockdown. For a kid like me this was unbelievable. The military rolled in to protect the athletes and the discussion was whether or not to cancel the Games. We were secured indoors and eventually they decided to continue. But it was like nothing I had ever seen before. DH: How did you progress at the Games? MJ: I won the Olympic Bronze at middleweight. I had beaten the Cuban, Montoya in the quarter-finals but lost to the eventual gold medalist, the Soviet, Lemeshev in the semis. Y’know, it was a very hard fight I had with the Cuban and I think it took a lot out of me. But…that sounds like an excuse and I hate fighters who do that. I just lost to the better man that night. It probably bothers me because I had beaten Lemeshev six months before. DH: With the Bronze around your neck, was it your intention to go pro immediately after the Games? DH: Who did you go pro with? MJ: Here’s a funny story. Indianapolis saw my potential but really didn’t have the resources to move me. A group got together headed up by the Indiana Pacers basketball team and that is who I was actually managed by at the start of my career. They were very good to me and saw very early that they didn’t have the know-how of the game and allowed me to sign with Russell Peltz of Philadelphia. Of course, Peltz was a promoter and could not hold a manager’s license by law, so Arnold Weiss, who I believe was Peltz’ brother-in-law, became my manager of record, although it was Peltz calling the shots. And of course, ‘Champ’ Cheney was my trainer. That wasn’t going to change. During my career I had been approached four different times by people wanting me to change trainers, saying that I would never make it out of Indy if I didn’t. But that wasn’t me. 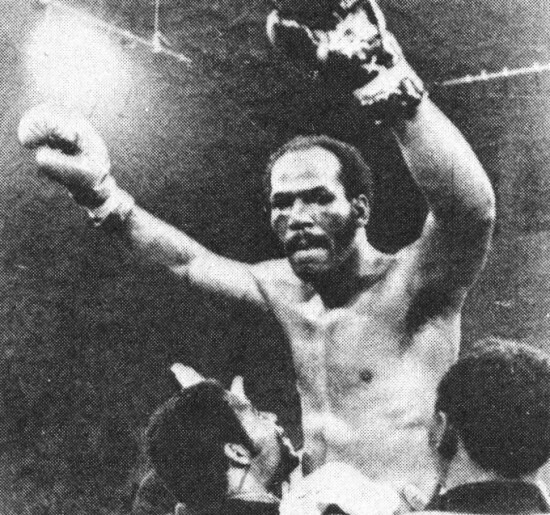 DH: Some of your Olympic team mates such as Duane Bobick and Sugar Ray Seales traveled a very slow road at the beginning of their careers, but by contrast, by your 10th pro fight you had fought veterans Gary Summerhays, ‘Red-Top’ Owens and Ray Anderson. Did you feel rushed or did you just acclimate to the pro game quicker? MJ: You have to have confidence in your team. I did as I was told in the gym, trained hard and was confident that I could handle anyone they were bringing in. So I wasn’t questioning it. 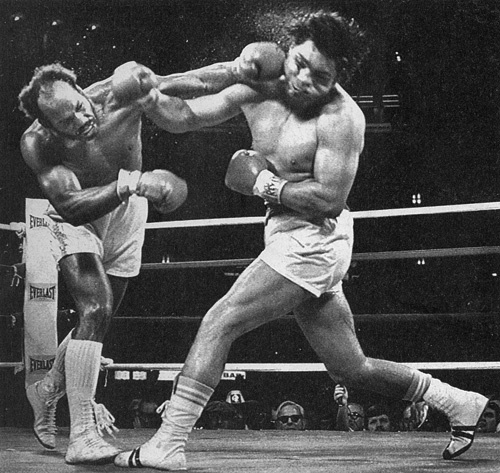 DH: In ’77 you fought and stopped your first world-rated opponent in Tom Bethea. That appeared to set you up for a shot at the NABF light heavyweight title against Matthew Saad Muhammad. This was a war. Tell me about it. MJ: It was a war. But…looking back, I don’t feel this fight was in my best interests at the time. Russell Peltz, you see, was promoting both of us. He couldn’t lose. Matthew and I hurt each other pretty good in that fight. I was way ahead but got stopped in the last round. DH: You got right back on the bike and ran through a lot of world class fighters such as Eddie Davis, Billy ‘Dynamite’ Douglas and Johnny Baldwin before fighting on the undercard of Parlov-Conteh in Belgrade against Lotte Mwale. He was awarded the decision and the media said you were totally robbed. Your thoughts? MJ: Y’now…I really didn’t have a problem with the decision. Mwale was a good fighter and I think he deserved the win. But, I’ll tell you one thing. I believe that loss is what got me my first title shot. I believe Mate Parlov’s people may have underestimated me. DH: I see what you mean. Despite the loss, you were the one to receive the title shot over in Italy. Parlov looked awkward but tough against Cuello and Conteh, but against you he couldn’t do anything. It looked like a rout. MJ: Still, I was surprised when the fight was stopped in the 10th and I was the new world champion. DH: It would’ve been understandable had you signed for an easier first title defense. We all knew it was going to be another war, so why sign immediately for Matthew Saad Muhammad? MJ: I was told this was mandatory and was not told that I had up to six months before making this defense. I just think my promoter was looking out for himself. I lost my title to Matthew and, with all the money that was floating around at that time, do you know I only made $75,000 for that fight? DH: Before the end of the year you were in the ring again fighting for the WBA light heavyweight title against the formidable Victor Galindez. Tell me about your preparation for that fight. MJ: Through my brother Hank, I was allowed to train at Fort Bragg with the military boxing team. I loved every aspect of their training and got in the best shape of my life. It showed because I won the title for the second time on an 11th round knockout. DH: I’ve often heard you say that you felt Victor Galindez was the best fighter you ever fought. MJ: And I believe that to this day. Galindez was so sneaky and so dangerous that I had to be on my guard every second because he was timing every move I made. Galindez was the best, but I will give Matthew credit for being the toughest. He took my hardest punches and kept coming. DH: Again, in your first defense you sign for another top-dog in Eddie Mustafa Muhammad. Eddie was known as a bit of a lazy fighter, so your all-action style seemed like it would take his measure. MJ: Yeah, but I caught a left hook early that separated a rib and lost the fight. And again, $75,000 for a title defense. You know I went into negotiations asking for (laughing) $1,000,000. I mean, I knew I wasn’t going to get that. I was just hoping to break $100,000. It seemed like that number was just a no-no for me and they were actually getting upset with me over it. DH: After the Michael Spinks debacle in ’81 you took a year off and then made an amazing turnaround. You won 14 straight, beating among others, Johnny Davis, Prince Charles Williams and Eddie Davis again. You also picked up the USBA title and Ring Magazine’s comeback of the year award while signing for your 3rd title shot in ’86 against Leslie Stewart for the vacant WBA title. Tell me about that fight. MJ: Leslie Stewart was a very good fighter. Very underrated. I felt so good in that fight and stopped him on cuts in 7 rounds to win the title for the 3rd time. DH: After a successful defense you ventured down to Port-of-Spain for a rematch with Stewart. This was such a reversal of form from a year earlier. What did he bring to the table that was so different? MJ: Nothing. I was simply at the end of my career. I always said when I didn’t feel it anymore I was going to get out. In training for that fight I was actually making myself fight. During my career I never spoke negatively to my wife about training or fighting. But the night before the fight I sat down and told her that I didn’t think I was going to win. Of course, she started crying, she didn’t want to see me hurt. They retired me on my stool in the 9th. I just didn’t have it anymore. DH: Was this your career-high purse? MJ: Yes it was. I finally broke the $100,000 mark. Y’know, my entire career I was told what an exciting fighter I was and how I was always packing them in. But then I would ask myself, “Well, where’s the money?” Well this fight went out to purse bids and again the offers were small. But then, Trinidad, where Stewart was from, came through on the bid. I made $265,000 for my very last fight. DH: Marvin, you fought seven world champions during your career and a slew of top contenders. Was there any fight out there you wanted that just couldn’t be made? MJ: Yeah, that fella fighting out of of prison in New Jersey, James Scott. I think it would have been a helluva fight between us. But I wasn’t going to be fighting him in prison. Maybe that’s why it wasn’t made. DH: You had been boxing a long time. Was it difficult walking away from the game? DH: What have you been doing with yourself since the career ended? MJ: I’m a Deputy Sheriff with the Marion County Sheriff’s Department. I’ve been with the Department for 27 years. But, although I’m grateful for the position, again, that was never in my plan. I may have been world champ three times, but my boxing career was a disappointment to me. To tell you how I feel, I usually avoid conversations on boxing. For the hard fights I went through I just feel that I was never paid what I should have been. With the kind of money some of the fighters were making, was $100,000 a lot to ask for? 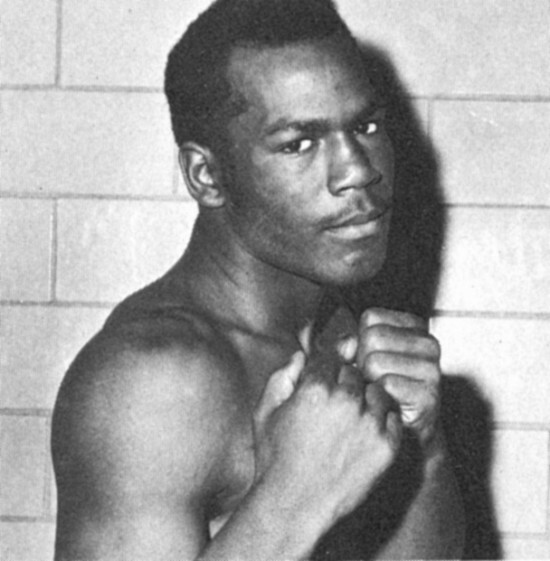 Marvin Johnson’s all-action style brought two things to the ring, a packed arena and a multitude of TV viewers. Bitterness, over what should have been, is obvious in Marvin’s tone. Afterall, he left a lot of blood and sweat on that four-cornered canvas. However, the glint in his eye is also evident as he speaks of Delores, his wife of 33 years, his 5 children and his 11 grandchildren. With a revered family life about him and the health to enjoy it, I think Marvin Johnson is a very rich man.